Deadheading means removing flowers that are fading or have finished blooming. Many perennials, daylilies and bearded irises, for example, have ugly brown floral remains and will look much better if you remove them. When flowers are pollinated they form seeds, which cost plants a lot of energy. If you prevent seed formation, you can direct energy toward other goals: producing new flowers and more leaf and root growth, all of which can help the plant look even better next year. With many plants, you can encourage a second flush of bloom later in the season. Modern repeat-blooming roses, perennial salvias and delphiniums, are good examples. Poppies and peonies don’t rebloom, but removing their finished flowers keeps the plants looking good. Some plants, such as Brazilian verbena (Verbena bonariensis) self-sow so enthusiastically that grow like weeds. Cutting off dead flowers prevents this. Spring bulbs: Remove finished flowers of hybrid tulips after bloom. Small spring bulbs, such as crocus, species tulips, snowdrops, scilla, chionadoxa, and daffodils that you are naturalizing (encouraging to spread under shrubs or in the lawn) don’t need deadheading. Annuals: Because true annuals are programmed to die after they produce seeds, regular clean-up of old flowers will prolong blooming. The following annuals benefit when you do this: bachelor’s buttons, calendulas, cosmos, geraniums, tall marigolds, snapdragons and zinnias. Modern annuals that are self-cleaning: Impatiens flower all season, their finished blooms falling to let new flowers come on. Old-style petunias need deadheading, but the self-cleaning Wave series introduced a few years ago, Surfinia petunias, the small-flowered Fantasy series, and the petunia-like million bells (Calibrachoa) all produce masses of flowers for months with minimal deadheading. Early-flowering perennials: By midsummer, plants such as rock cress, lady’s mantle, perennial candytuft, creeping phlox, catmint, lavender and cranesbills (hardy geraniums) grow floppy or leggy. 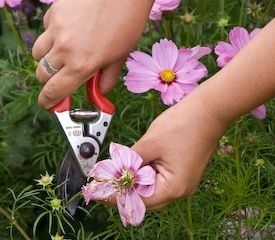 Shear them to remove spent flowers, and also cut their foliage back by half to promote fresh leaf growth. Flowering shrubs: With rhododendrons, pinch off old flower-heads by hand, but do this carefully because the tips of new growth are developing right behind the old flowers. Improve the appearance of lilacs by pruning off spent flower stems immediately after flowering. Next spring’s buds are produced in June and July, so avoid doing this pruning any later. Roses: With repeat-blooming roses, prune the flower stems back to the first leaf bud below the spent cluster to promote active growth and more flowers. For old-fashioned shrub roses that bloom once a season, unless you want rose hips, prune off finished flowers to prevent energy going into seed production. Plants such as clematis, sedum, most ornamental grasses and coneflowers (Rudbeckia and Echinacea species) have attractive seed heads that you can leave in place for winter interest and to attract seed-loving birds. Cut these plants back in early spring before growth resumes. Snap – To break off spent blooms of daylilies, iris, rhododrendons, it’s easy to use your hands. Pinch – Nipping off multi-flowered plants such as petunias and marigolds is easily accomplished with your thumb and forefinger.